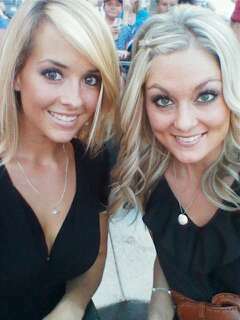 TTBB Investigates: The Blonde Babes Behind Home Plate | That's Twins Baseball. A Minnesota Twins Blog. ARLINGTON—A couple days ago, guys watching the Twins game against the Rangers likely noticed more than a catcher and an umpire behind the plate. Sitting in the front row at the Ballpark in Arlington were two voluptuous vixens watching the game. Suddenly twitter and message boards everywhere in Twins Territory exploded asking who they were. Well I contacted my sources and after a little digging, figured out who those gals were. Their twitter handles are: @TheBlondeSide and @PaigeBlessed. Once the word got out on twitter, @TheBlondeSide suddenly had plenty of new followers from Minnesota (probably a large majority of them males). After some conversation @TheBlondeSide shared a tweet thanking all of her new Minnesota friends for following, along with this picture…..
Here’s the tweet confirming what my sources had said. (For some context, I had tweeted that everyone was wondering and tweeting “who those blonde girls were” last night and then she asks what they were asking)….. 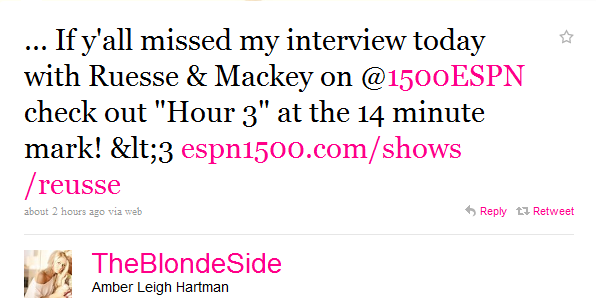 There were rumblings on twitter that @PMac21 from ESPN1500 Twin Cities was trying to line up an interview for the Reusse and Mackey Show. I haven’t heard if the interview has been secured but I do know if it is, it will be the most anticipated interview since Frost interviewed Nixon. The interview was great. If you missed it, you can listen to the podcast as listed in this tweet…..
Good Talk, we'll see you outside. this could be the most significant interview of the season for Twins’ Fans if it happens. I know I’m waiting on the edge of my seat. Maybe we can get PMac to find a beautiful woman at each game, and give out her twitter name and an interview. Even casual baseball fans would keep watching with beautiful women all over their TV screens. I jest, but only a little. Bring on baseball babes!